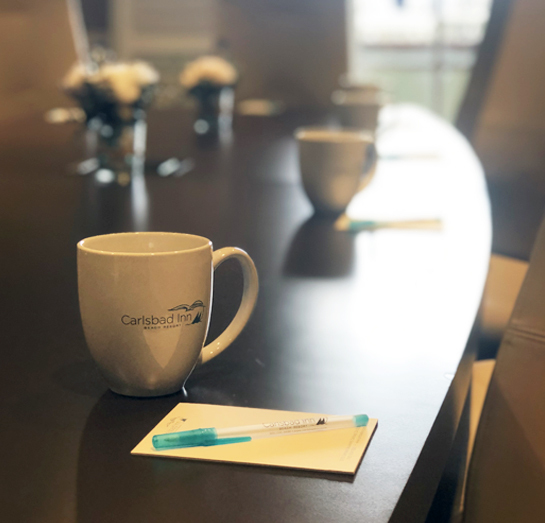 Whether you are planning a business meeting, corporate retreat, training, celebration or family reunion, the Carlsbad Inn Beach Resort offers a peaceful, productive environment for all occasions. Our 3 private event spaces can accommodate groups up to 70 people. With the ease of using your own caterer and our dedicated staff, your event will flow smoothly and effortlessly. A functional and comfortable setting for business, conferences, think-tanks and small corporate gatherings. Features a conference table, small refrigerator, flat screen TV and partial ocean views. Accommodates up to 12 people. With a wall of French doors that open onto a wrap-around deck, the Sunset Terrace provides views of our pool, courtyard and the stunning Pacific Ocean with ocean breezes. Accommodates up to 60 people. This room offers an open setting with vaulted ceilings, large windows and french doors that open to a veranda overlooking the Carlsbad Village. Ideal for milestone events or corporate groups. Accommodates up to 70 people. Our amazing location by the sea will help your team be as productive and efficient as possible. There’s nothing like salt in the air and an ocean breeze to inspire ideas and creativity. Party west coast style with laid-back vibes and breathtaking sunsets. Whether you're having an engagement party, baby shower or sit-down dinner we have a space to match your needs. We also have a list of preferred vendors for every occasion so you don’t have to do all the research.